New signing Antonio Barreca was blown away by Newcastle United’s win over Manchester City. The left-back today joined the club on loan from Monaco. And Barreca watched highlights of Newcastle’s 2-1 win over the Premier League champions as the proposed deal was formalised. “I saw the highlights – the team seemed to be very united, they fought for every ball and never gave up, even though they went behind early on,” said Barreca, who could be involved in tomorrow’s game against Tottenham Hotspur at Wembley. Attack-minded Barreca – who started his career at Torino – feels that he’s ready for the Premier League. 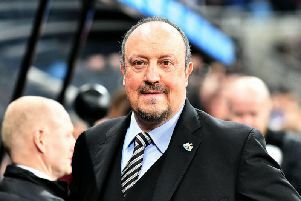 Barreca is looking forward to learning from United manager Rafa Benitez. “He did really well in Italy, and I think that he’s a very good manager with a lot of experience,” said Barreca. “He’s showing what he is able to do in the Premier League, and that’s not easy at all."